AIC’s wind sensor -- no moving parts. AN innovative wind speed and direction sensor has been released by Amalgamated Instrument Co (AIC). The sensor has no moving parts. This, in itself, is not unusual as there have been sensors, using ultrasonic technology, available for some time. The new sensor, however, uses completely solid state CMOS technology. Minute temperature differences caused by air flow across the surface of the detector are translated into wind speed and direction readings. No moving parts means that the sensor requires very little maintenance. The sensor is resistant to pollution and salt contamination and has IP65 environmental protection against humidity and precipitation. 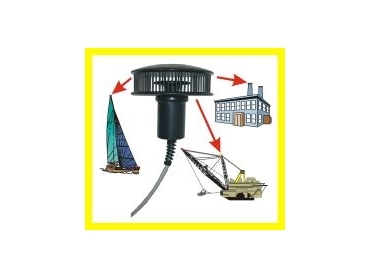 The sensor is also suitable for shipping, yachting and other mobile applications. The sensor is aligned to North for fixed applications and toward the front of the vessel or vehicle for mobile applications. Installation is very easy. Wind speed range is 2 to 25m/sec (7 to 90km/h) with an accuracy of 0.5m/sec ±3% and a wind direction accuracy of ±3°. The computational elements of the sensor are housed in the "stem" of the unit. The data giving values for wind speed and direction are transmitted as an RS422 or RS232 serial data string. The data string is compatible with AIC's serial input instrumentation such as the PM4-RS panel mount model. The sensor can also be connected directly to a PC, PLC or other equipment able to accept and interpret the data string.